The Memorial Cup was originally known as the OHA Memorial Cup and was donated by the Ontario Hockey Association in March, 1919, in remembrance of the many young men and women who paid the supreme sacrifice for Canada in the First World War. 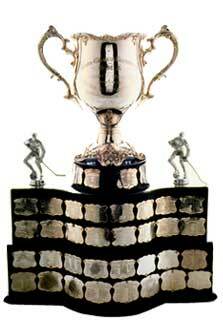 Initially the Cup was awarded to the national junior hockey champions of Canada. Later on it came to signify Junior 'A' hockey supremacy when in 1934, junior hockey in Canada was divided into 'A' and 'B' classifications. In 1971, junior 'A' hockey was divided once again to form a major junior and a Tier 'II' level. The Memorial Cup was awarded to the higher category. In 1972, a round-robin tournament format replaced the old play-down system to determine the champions. Since then, the champions of the Western Hockey League (WHL), the Quebec Major Junior Hockey League (QMJHL) and the Ontario Hockey League (OHL), along with a host club, have met each spring in a round-robin series with the two top teams playing off in a sudden-death game to determine the Cup champions.